I went to the airline counter at a little after midnight. “It’s probably in Phoenix, but it will take at least 24 hours to locate it,” said the airline representative of my bag. That was not good news, as Lynn’s traveling foxhunting crew was picking me up at 7 a.m. to go on the road trip to Belmont. Belmont is a ghost town in central Nevada about 7,400 feet in elevation. It has no public utilities: no electricity, no mail, no phones, and no stores to buy the needed particulars to replace those currently vacationing with my luggage. I know I must have given her one incredulous look. “There is no address in Belmont. It’s a ghost town about 300 miles from here. Mail doesn’t exactly go there,” I replied. I am born and raised in Tennessee. I had never been to Nevada before and didn’t even know exactly what a ghost town was. In preparation for the December cold, I had bought the best Smart Wool tops, bottoms and socks that I could find in Knoxville. Lucky me, all my preparations were now vacationing without me in Phoenix of all places. My carry-on bag held just my wallet, camera and lenses—not one stitch of clothing. 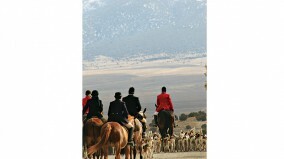 Can you imagine traveling cross-country to foxhunt, then arriving without your boots? Without breeches? Hell, without underwear? In the snow? When your final destination is a real ghost town with no electricity? Ah! When it reached the civilized hour of 5:30 a.m., I called Angela Murray, whipper-in for the Red Rock Hounds, from the hotel. “Well, Angela, I’m here, my camera is here, but my clothes are not,” I told her. A few minutes later, her 11-year-old daughter, Audrey, called me to say, “Mommy’s getting you some clothes.” Little did I know what an understatement that would turn out to be. At this point, I decided to kick on and give up on my clothes. I again called the highly irritating 800 number to tell the airline to ship my bag home to Tennessee whenever they finally found it. I then proceeded to spend a most fantastic trip wearing other peoples’ clothes. The morning of the first hunt, I found every article of proper hunting attire in the bags, plus long johns and wool socks. The day I went hiking on the hill behind the saloon, I found a pair of fleece-lined boots that fit. The day it was 4 degrees in the morning, I found a knit hat and ear warmers. When it snowed the last day, I discovered ski pants and gloves in the bottom of the bag. I even had cowboy-boot slippers. It was like Christmas every time I looked in the bags! Belmont is full of ruined stone houses and an abandoned, four-story, brick courthouse. It was a silver mining town that was empty by the early 1900s. Only one lady lived in the town for about 60 years, but Henry and Bertie Berg now run a bed-and-breakfast in the center of town, and about eight people live in Belmont permanently. There was water from the well and a generator did give us some lights, but this was definitely a rustic place. The first night in Belmont, we got acquainted with everyone who came—about 16 of us. Some of us had rooms in the old mining office-turned-bed-and-breakfast, but the rest of us were in the separate bunkhouse on the hill. Walking back to the bunkhouse after taking a shower resulted in frozen hair. I would then trek to the saloon wearing the cowboy boot slippers and sporting lovely icy hair. The saloon was a small, rock-walled room with one table, a bar top, lots of history, tasty Manhattans and even a pet wolf for company. Standing in front of the wood stove to thaw was the spot everyone wanted. Our first day out hunting, Dec. 12, was a glorious day. The sky was so blue and the sun was very, very bright. I had my camera with my long zoom lens around my neck and stuffed it in the front of the over-large, borrowed melton. Upon seeing how well the camera filled out the front of the melton, one member remarked how now I could fit into that huge bra. Hunting with Lynn Lloyd is an adventure in itself. After five minutes of the first day out I learned why everyone has a nervous laugh when talking about the infamous “LLL” or the “Lynn Lloyd Line.” Lynn decided to cast up the side of a mountain and leave the nice, level, lovely, level, large, inviting, level, wet and flat valley. Now being from East Tennessee, at the base of the Smoky Mountain National Park, I thought I knew hills. I’ve even ridden up to the Appalachian Trail before. But I soon learned I didn’t know a thing about hills, or mountains, or even rocks, for that matter. I can’t really explain just how steep this mountainside was or give a legitimate description of just how crazy the footing was. I can say it was steep enough that Joy Smith’s spurs were tickling her horse’s stifles. And the footing wasn’t dirt—just rocks. Every kind and size of rock was there to trip-up, slip-up or avalanche out from under your horse. There were so many rocks that even the sagebrush didn’t want to grow on that mountain. I decided to add a degree of difficulty to the endeavor, so I rode all the way up with my pommel down one side of my horse’s ribs. My saddle slipped back and drastically off to the side in the first 10 minutes. And it took forever to get to the top of this mountain of rocks. That’s a long time to ponder just how many ways I could die with a slipped saddle, on an unknown horse, carrying my very expensive camera, in foreign clothes, in an alien territory, up a damn mountain, following an obviously crazy lady. Finally there was a somewhat “flat” spot, and I got off to adjust my tack. Rosie stood downhill from me, and I had to lean against her horse to reset my saddle. What’s In Your Cigar Holder? Of course, once we crested the top of the mountain, we then had to go down the other side. The footing of rocks would avalanche out from under my mare, and both front feet would slip out from under her. She would slide a few feet, stretched out like a park horse, until she could stop herself and get a hind leg under her. And I had heard tales about galloping down these mountains? Are these people nuts or just slightly deranged? But take away the shock of the territory to this Southerner and the hunting was great. We got on several coyotes and raced around those valleys for three days straight. Lynn brought more than 40 Walker hounds, and the echo of them singing all around us was thrilling. There was one line I watched the pack work for more than an hour. Workmanlike and dedicated, the hounds knew just what to do. That day it was 20-something degrees in a stiff wind, but it was only when I couldn’t hear the hounds any more that I got cold. The hounds were great to watch. On Saturday morning, I was finding an outdoor latrine around the corner of the barn when I discovered a new problem. Oh, how to put this delicately? Due to certain feminine pills vacationing with my clothes in Phoenix, a certain feminine event occurred early. Just before the hunt. I went to Angela and explained my situation. She grabbed my shoulders and said something that had me very confused. She told me that MFH John Schafer could help me. John dug around in his truck and came up with a cigar holder. On one side was a cigar, and on the other was a certain feminine product. Now I’ve been married before (twice, actually). Was there something about the male anatomy I had missed? I just stood there, speechless. He explained, “When I joined Red Rock Hounds, Lynn told me that if I ever wanted my colors I had to carry two things at all times: a flask and a tampon!” He’s now a Master. The last night I bought everyone a round at Henry’s saloon. I raised my glass to thank everyone for letting me wear their underwear, bras, breeches, long johns, stock ties, socks, etc. I can honestly say that I’ve never made a toast like that before. The Naked Foxhunter Harks Forward!